There are two major types of wind turbines. A horizontal axis wind turbine is one which rotates around a horizontal axis. Horizontal axis wind turbines (HAWTs) are commonly used. They are far more efficient than vertical axis wind turbines which are the second type of wind turbine. A HAWT has the main rotor shaft and electrical generator mounted at the top of a tower. HAWTs must point into the wind to be able to harness wind energy. Smaller turbines are pointed into the wind by a wind vane arrangement. Larger turbines, such as those used in wind farms, have a wind sensor and a motor which turns them to face into the wind. As most large HAWTs have a relatively slow rotating speed. A gearbox is required to turn the slow blade rotation into a faster rotation that is more suitable to drive an electrical generator. HAWT blades are made stiff to prevent them from being pushed into the tower by high winds. The blades are also placed a fair distance in front of the tower and are sometimes tilted up a small amount. This increases efficiency by avoiding turbulence created by the tower. Downwind HAWTs have been built, despite the problem of turbulence. A Downwind HAWT is a turbine with the blades mounted behind the tower. Downwind HAWTs don't need an additional mechanism for keeping them in line with the wind. In high winds the blades of a downwind HAWT (which are flexible) bend without worry of tower interference. This reduces their swept area and subsequently their wind resistance. However wind turbulence from the towers lead to fatigue failures in downwind HAWTs. As reliability is so important, most HAWTs are upwind turbines. Take a detailed look inside a wind turbine here. There are different types of HAWTs. Two general types exist. These are windmills and wind turbines. Windmills generally provide mechanical power for uses such as grinding and pumping. Wind turbines tend to be the choice for the production of electricity from wind energy. Our focus here is on HAWT designs used for electricity production. The horizontal axis wind turbine design used in wind farms for commercial production of electric power are usually three-bladed and are pointed into the wind by computer-controlled motors. These have high tip speeds (up to six times the wind speed), are highly efficient, and have low torque ripple which contributes to their reliability. The blades are usually colored light gray so as to blend in with the clouds. Blades range in length from 20 to 40 meters (65 to 130 ft) or more. They typically turn at between 10-22 revolutions per minute. The tubular steel towers range from about 60 to 90 meters (200 to 300 ft) high. This lifts the rotor to heights where wind speed can increase significantly over the ground speed. 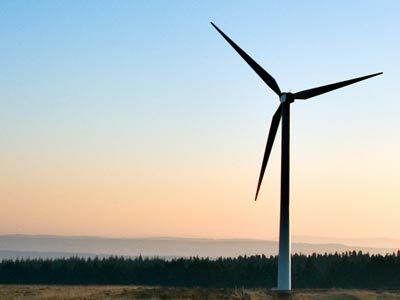 Every commercially operated horizontal axis wind turbine is equipped with high wind speed shut down features to avoid damage in extreme conditions.